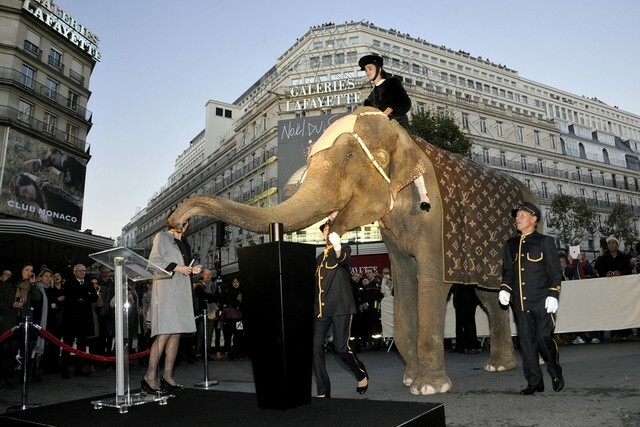 Galeries Lafayette in Paris kicked off the celebration of their holiday window displays with a live elephant dressed in Louis Vuitton swag. The window theme is “The Ball of The Century” and marks the centenary existence of the glass dome store. The window depicts wild and exotic animals surrounding luxury leather goods and designer clothing, while stacks of vintage luggage pays homage to Louis Vuitton’s 158 years of history. After all of the hoopla and after all of the retail officials gave speeches, the elephant turned on the store’s lights with his trunk.